Parents seek solutions after learning that drinking milk can interfere with consuming enough iron. My 3-year-old Theo still drinks a whole lot of whole milk, still from a sippy cup we’re coaxing him to replace with a glass. Someone should silkscreen him a Body by Milk T-shirt, since much of his sinewy 41-plus pounds of muscle comes from ingesting cow dairy calories – in addition to the breast milk I nursed into him for 16 months, plus countless non-dairy nut and grain milks and a few tentative bottles of mostly organic formula. For all their nutritional benefits, cow’s milk and the breast milk our bodies make beyond the six-month post-partum mark, lack iron, containing 0 percent of a toddler’s recommended daily intake. Grind part of a fresh, skinned beef tongue and heart together with sirloin to stretch out your choice lean meat, making a more economical burger. Or grind raw tongue and heart into store-bought pre-ground chuck or round. The organ meat adds nutrients to the ground beef and puts underused offal cuts to good use, Salatin says. Combine one-third non-encased pork sausage with two-thirds ground beef to form each patty. The sausage adds zest to the patty, as well as some fat to hold the lean beef together. The extra juices yield a moist, better-cooked burger. What’s more, one of milk’s great virtues – that it is a rich, easily digestible source of calcium – can actually prevent the body from absorbing iron when these two key minerals are consumed in tandem. (Maybe there’s real dietary wisdom behind the ancient Jewish custom of keeping milk and meat separate at meals?) What’s a busy mom to do? A routine complete blood count at the 1-year-old checkup of her daughter, Dosia, now 5, totally blindsided Ryland Waller Herring, my lifelong friend from Virginia and a mother of two. Her pediatrician had called to report that Dosia was slightly anemic; her hemoglobin count of 9.8 was just under the line. The doctor recommended iron drops until the levels stabilized. But strong-willed Dosia wouldn’t have it. So health-conscious, then-full-time working mom Ryland decided to modify her daughter’s diet instead. Her pediatrician was adamant that kids (if their families are not vegetarian) need the readily available stores of iron in red meat much more than adults do. She told Ryland to give Dosia beef, even every other day, until her hemoglobin and hematocrit levels stabilized. So though the Herring family normally ate red meat once a week tops, they followed the doctor’s orders. At their H Street Farmers Market in Washington, D.C., where they lived at the time, the Herrings loaded up on good beef from cows that grazed freely in Pennsylvania’s Amish country. They bought ground beef instead of steak, less a choking risk for their novice chewer, and cooked mini-burgers to freeze and defrost for quick work-night dinners and nanny lunches. Precocious Dosia even dipped her breadless mini-sliders into hummus instead of the sugar-clogged ketchup her mother tried to avoid. Dosia ate bites of burger alongside strawberries and other fruit chunks, since Vitamin C is said to enhance the digestion of iron. They also increased iron-rich foods like broccoli, spinach and chickpeas – and, of course, fortified cereals. But Ryland is sure the good grass-fed beef helped most to stabilize her daughter’s iron levels to normal by her next appointment, just as it later did for her now 2-year-old son Sheppard. Now expecting her third child, and taking daily vitamins to ward off the iron deficiency that often afflicts pregnant and nursing mothers, Ryland is mindful of iron’s crucial role in our diets. Let’s hope our own sweet Theo is in the clear. He’s even more a milk-aholic than Ryland’s daughter. 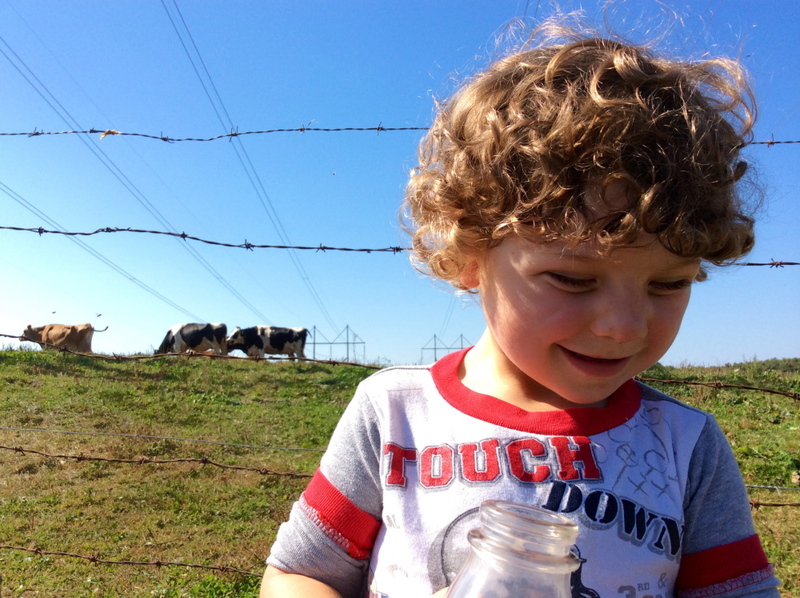 He always exceeds the at least two cups of dairy a day the U.S. Department of Agriculture recommends for his age. Might we muster the discipline for water only with dinner? Still, I hadn’t realized all that otherwise virtuous milk could be contributing to anemia. Theo does tend to have telltale pale skin and dark circles under his eyes, and so do I (awaiting iron test results this week: perhaps that’s why our family was especially susceptible to that phlegmy, feverish, back-to-school virus still making the rounds). Fortunately, two of Theo’s buddies have very accessible pediatricians (both trained as osteopaths) for parents. Though I try to limit my questions, they both freely dispense gentle advice after Music Together classes or other kiddie events, where these non-urgent but endless worries about their children occur to mothers. Brunswick pediatrician and mom Dr. Whitney Latham clued us into the milk-anemia connection as we chatted at an outdoor family concert this summer. I expressed concern that Theo glugged so much. Most pediatricians recommend toddlers drink whole milk only until age 2. We have wondered if Theo might fill up less on 2 percent, leaving more room for iron-rich foods. Anemia was Latham’s main concern. During a blood draw to test for allergies this summer, Theo’s iron levels came back at 17 ng per milliliter – on the deficient side, since doctors like to see a range of 5 to 100. Martin’s Point pediatrician Dr. Andrea Tracy in Brunswick recommended a daily iron-fortified vitamin, such as the Animal Parade ones found in natural food stores. We’re still not sure if vitamins are bogus if you eat a balanced diet, but Theo, commanding us to “say hi to the cat” shape, loves their taste. And beware of iron-poisoning: We remember hearing scary reports on the risks of consuming too many candy-like Flintstone vitamins – not to mention expensive and addictive Sour Patch Kids-like Nordic Naturals. We also took a cue from my friend Ryland, and after a summer of too many good, local beef-pork hot dogs, finally got Theo to enjoy a grass-fed hamburger made with tender, almost steak-like ground beef from Apple Creek Farm in Bowdoinham. “Yeah, I like hamburger – it taste yummy!” Theo declared, dipping it in copious amounts of organic ketchup. And his parents’ hearts soared. After going for half a hog and a whole lamb last winter, we’ll build meals around good grass-fed beef this season – of course everything in moderation. Laura McCandlish is a Brunswick-based food writer and radio producer. Follow her on Twitter @baltimoregon and read her blog at baltimoregon.com.